You’ve got to give the Eagles front office plenty of credit for improving their football team at the beginning of 2017 NFL free agency, despite having only a small amount of cap space to work with. It didn’t look like the Birds were going to be able to go after the top players, but they found a way to get it done. Just before the NFL free agency door opened, the Birds got started by acquiring a legitimate deep threat for Carson Wentz. The Birds signed Torrey Smith to a three-year deal for $5 million dollars a year. Smith, who was released by the San Francisco 49ers, says he hasn’t lost any of his game-breaking speed. He was clocked at 4.36 in the forty-yard dash, just prior to his rookie season. The Eagles V.P. Of Player Personnel, Joe Douglass was in the Ravens front office when they drafted Smith out of the University of Maryland. Obviously, Douglass believes in the veteran sprinter. The former Raven, who won a Super Bowl title while in Baltimore, will provide the deep speed that should force opposing safeties to backup or run the risk of getting beaten deep by Smith. After the Smith signing, the Eagles made their most surprising move. Howie Roseman and Company signed a big, physical and talented wide out, who was considered the best wide receiver available in the free agency this year. Of course, I’m talking about Alshon Jeffery, who comes to Philadelphia, after five years in Chicago. The Gamecock out of South Carolina has something to prove because he’s coming off of two subpar seasons, where he caught 54 passes in 2015 and 52 passes in 2016. He plans on turning things around for the Eagles and getting backs to his 2013 and 2014 pass catch totals where he caught 89 and 85 passes, respectively. Wentz will now have a legitimate number one receiver, who with his size, 6’3″ 218 pounds, is very effective on third downs and in the red zone, when games are on the line. The next free agent signing the Eagles made was also to help Wentz, but this time it was to protect by adding depth to their the offensive line. The Birds signed Titans guard Chance Warmack, who is a former first-round draft pick. He will be reunited with offensive line coach, Jeff Stoutland, who coached Warmack in Alabama, where the youngster played on three-National Championship teams. The big, physical guard said he’s looking forward to working with Coach Stoutland again and he’s confident the coach will be able to help him take his game to another level. In another move to add depth to the offensive line, the Birds signed fromer Penn Stater, Stefan Wesneieski. He had a good year for the Eagles in 2016, as he showed them, he can step in at guard or center and do a very good job. 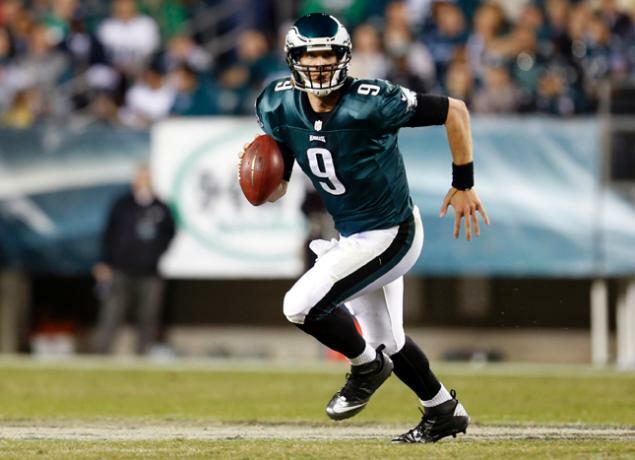 Finally, the Eagles welcomed a former Eagles quarterback back to the fold, as they signed Nick Foles to a two-year deal. Foles, who had the best seasons of his career with the Eagles, will give the Birds more insurance at the quarterback position. He won’t likely get the chance to repeat his Pro Bowl season of 27 touchdowns passes and only two interceptions, but he’s a much better option than Chase Daniel. Daniel, who threw one pass for the Eagles during his 16 games, looked awful last year in the preseason. He might have been help Wentz in his understanding of the West Coast offense during his rookie season, but the coaching staff couldn’t have had much confidence in him as a quarterback after getting a look at him in the preseason a year ago. Daniel, who is about 5’10”, doesn’t have a strong arm and has trouble seeing over the big NFL defensive linemen. The one regret I see with the Eagles free agent moves concerns former Cleveland Brown, Terrelle Pryor, who signed a one-year deal with the Washington Redskins. Looking back in hindsight, the Birds could have signed Pryor instead of Torrey Smith. Pryor has the same deep speed, but he’s 6’4″ instead of 6′. Could you imagine the headaches the Eagles receivers would give opposing secondaries with the 6’3 Jeffery lining up on one side and the 6’4” Pryor lining up on the other. There isn’t a secondary in the league, which could match up with those two effectively. i’m cursed. I finally comment on gcobb celebrating the new receivers then I wake p to a Nick Foles signing. Damn. Howie last offseason had a great free agent signing period and from what it looks like a damn good draft that the Eagles got a lot of use out of. Year 2 u can check everything off the box again. He managed the cap. And handled priority number. 1. Get Wentz weapons. Years 1-2 could not have gone any better so far. He has done everything perfect and proved he was in a room plotting when he got demoted for chip Kelly. We now have a good back up. Wentz will likely get along with Foles and guys will respect both as the players they are. Haven’t been around in a while but wanted to say that I love what we have been doing this off-season. Foles is what he has always been… A very very good backup qb. I pray some of the old silliness comments don’t find their way back around here. If anything happened to big W, Nick could step in and lead this team IMO. Obviously adding the kinds of Wrs that we have will open the field for a guy like NA to have a very solid season. Taking the pressure off him here might be huge. That said.. If one of the top WRs falls to us, draft him. And.. We need to be adding pure speed there. No doubt that we are 1 more offseason away from making a deep push in the playoffs. I believe we can get there this year no problem BUT the goal must be to add talent in the draft and develop home-grown talent for the future. Guys like Peters and Sproles will be coming off the books in the near future and they need to use this time to develop behind them. I see this team to be a 10 win team as it stands now. It’s odd how similar the old eagle team is to this one. They need a good draft like the Rhodes group had back in the day. Paulman In regards to all teams,this time of year ,subtractions are more influential ,than addittions..Fiscal projections of knowing you have to pay other guys is part of the matrix in todays nfl.its predicted on someone valuing a piece more,for whatever reason. .in the few words you attribute to the birds ,howie has a show me deal with his whole receiving corp they subtracted from their back end and i agree theyll need direct there attention there.in regards to kendrick and the local cards ,theres talking going on for thrre slot ..
Only OT’s and a couple CB’s got Crazy $$$ this Year..